Supreme Court held that a complaint against termination of an employee of a company is not only maintainable in a Labour court having jurisdiction of the place where the employee was working, when the termination was ordered, but also the Labour court having jurisdiction of the place where the decision to terminate the employee was taken by the management of Company. Supreme Court on Tuesday, delivered a landmark Judgment holding that Chairman, Directors and Officers of Global Trust Bank Ltd. (a private bank before its amalgamation with the Oriental Bank of Commerce), can be said to be public servants for the purposes of their prosecution in respect of offences punishable under Prevention of Corruption Act, 1988. Supreme Court held that a candidate who appears in an examination under the O.B.C. category and submits the certificate after the last date mentioned in the advertisement is eligible for selection to the post under the O.B.C. category. Constitution Bench of Apex Court held that Section 23 of the Travancore-Cochin High Court Act remains unaffected by the repealing provision of Section 9 of the Kerala High Court Act, and that, being in the nature of special provision vis-à-vis Section 98(2) of the Code of Civil Procedure, would apply to the Kerala High Court. The Supreme Court held that an accused, by virtue of Section 106 of the Evidence Act, is duty bound to explain as to how the death of the deceased was caused, when it is proved that both of them were in the same home at the time death had occurred. The Supreme Court asked the State to identify a suitable site to accommodate the small scale shop keepers of Shirdi who were facing eviction. The court also said that if the alternate site cannot be identified, they need to be compensated with an amount of Rs. 20 lakhs and Rs. 15 lakhs each respectively for the bigger and smaller shops/stalls. The Supreme Court held that an earlier suit for possession does not bar institution of a later suit for partition and it is not hit by Principle of Res Judicata, putting an end to five decade long property dispute between members of a family who, upon the direction of the court, finally agreed for a reasonable settlement. Bench comprising of Justices Kurian Joseph and R.F. Nariman. 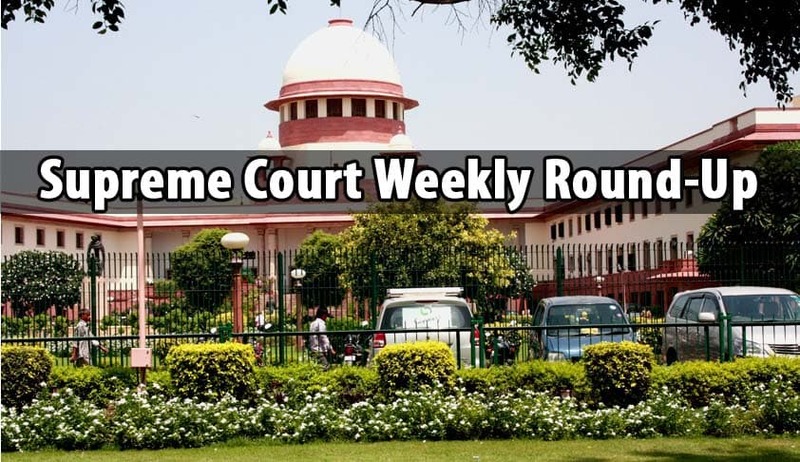 Supreme Court set aside the order of acquittal by high court and taking note of the reluctance of people to come forward to give statement in respect of criminal cases, said that prosecution case cannot be doubted merely on the ground of absence of Independent witness. The Supreme Court of India on Monday issued notices to Uttar Pradesh and Haryana Governments, directing them to take quick action to end the water scarcity in Delhi. The Court has been assured by the Haryana Government that water supply will resume in NCR region by the evening. The Bench, headed by Chief Justice T.S. Thakur also sought a report from Haryana Government on Delhi Government’s petition seeking resumption of water supply. On Tuesday, The apex court dismissed a Public Interest Litigation which sought making intelligence agencies like the Research and Analysis Wing (RAW), Intelligence Bureau (IB) and National Technical Research Organisation (NTRO) accountable to the Comptroller and Auditor General (CAG) of India. The Supreme Court on Tuesday issued notice to Central Government on a petition filed on behalf of Mr. Prashant Bhushan regarding non-issue of full-validity passport to him. (Prashant Bhushan v Union of India &Anr). The Supreme Court has asked the government to file its reply within 3 weeks. The Supreme Court on Wednesday expressed concern at the increasing number of agitations in the country in which public property is destroyed and observed that the protesters must be made to pay damages for the loss of nation’s assets. The court said it will lay down rules in this regard if the government did not do so. The Supreme Court on Wednesday, asked the Maharashtra government to file its response on several objections raised by Hotels, restaurants and Dance bar owners in the new license policy brought in by police. Supreme Court on Friday, refused to entertain a PIL which challenged the validity of the Juvenile Justice (care and protection of children) Act 2015 saying it cannot be a subject matter of a public interest litigation and can only be admitted if an aggrieved comes before the court. The Supreme Court on Friday issued notices to three lawyers shown in a TV sting bragging about bashing up JNU case accused Kanhaiya Kumar and others on a petition filed by lawyer KaminiJaiswal seeking initiation of contempt proceedings against them. National court of Appeal with regional benches? A Supreme Court Bench headed by Chief Justice of India TS Thakur on Friday issued notice to Centre seeking response on a plea for setting up of National Court of Appeal with regional Benches. The Court has appointed Senior Advocates K.K.Venugopal and Salman Khurshid as Amicus Curiae in this Case.